This is an amazing opportunity that is so much more than 'just another tote bag’ class. 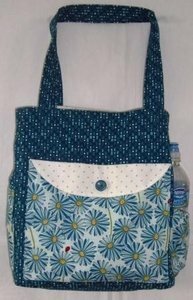 At the end of this class you will walk away with a completed bag, but you will also take with you a wealth of tips and tricks that will enhance and excite your sewing projects for years to come. From sewing perfectly straight seams to simplifying elastic and gathers to everything in between; this is the perfect class to fill in the holes of any sewist's knowledge repertoire.